Oregon is a beautiful state that offers world-renowned outdoor recreation and adventure as far as the eye can see. Whether visitors are seeking Crater Lake National Park or Haystack Rock at Cannon Beach, they’ll need a place to rest their heads after a fun-filled day of exploration. From sensational restaurants to rejuvenating spas to sparkling pools, these resorts have everything visitors will need for an exceptional experience. Sunriver Resort is comprised of 3,300 picturesque acres situated along the winding Deschutes River in Sunriver, Oregon. 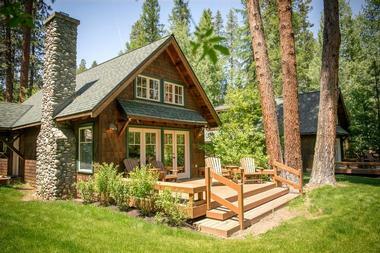 The resort’s guests will appreciate its close proximity to Sunriver’s Village Mall, restaurants, and retail shops. There are several outdoor activities available for resort guests to enjoy that include tennis, golf, biking, swimming, horseback riding, and kayaking. Guests will have access to the Sage Springs Club & Spa, The Cove Pool, The Crosswater Grille, and Crosswater Club. Also onsite is a lap pool, fitness center, steam room, and hot tub. The accommodations are warm and inviting, provide modern and comfortable furnishings, and feature rustic design. They’re equipped with plush bedding, complimentary wireless Internet, flat-screen TVs with premium cable, private bathrooms, and Keurig coffeemakers. 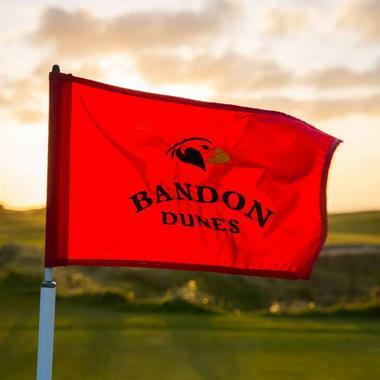 Travelers who are looking for the ultimate golf getaway should look no further than Bandon Dunes Golf Resort in Bandon, Oregon. A true representation of Scotland’s historic links courses, players will immerse themselves in a timeless game along Oregon’s rugged coast. They’ll enjoy sweeping, untamed shores, primeval grassy dunes sprawling to the sea, and breathtaking views over the North Pacific Ocean. The resort offers a variety of well-appointed lodging options that range from single rooms up to four-bedroom Grove Cottages. The accommodations are spacious and bright, elegantly decorated, and comfortably furnished. They’re equipped with private bathrooms, flat-screen TVs, plush bedding, and complimentary Wi-Fi. The resort also features a massage center, hot tub, sauna, fitness center, on-site dining, and gift shop. 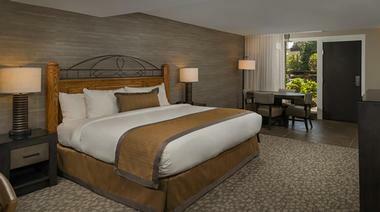 Inn at the 5th is Eugene's premiere luxury boutique hotel, honored with a four-diamond rating from AAA. The hotel, which is located within the city's historic 5th Street Public Market, has been ranked as one of the nation's top 15 hotels by TripAdvisor, offering exclusive luxury amenities such as Mercedes-Benz shuttle service for select guests and complimentary cruiser bike rentals for city exploration. All guest rooms and suites are decorated with artwork by local artists and stocked with custom-made Italian linens, with amenities such as built-in fireplaces, walk-in showers, and private butlers' pantries available in select rooms. French-inspired dining is offered at Marché, while a wide variety of self-care treatments are offered at the Gervais Day Spa and Salon. Black Butte Ranch is one of the Cascade Mountains' most popular vacation destinations, located within Deschutes County approximately eight miles from the town of Sisters. The ranch, which was founded as a planned community in 1971 and is home to a permanent year-round population of more than 350 residents, offers public lodging and resort amenities to overnight guests, with 120 lovely rental homes and condominiums offered on site at its 1,800-acre property. Two championship golf courses are offered, including the award-winning Big Meadow Course, named as one of Oregon's best golf courses by GolfWeek Magazine. Guests can also dine at the fine-dining Lodge Restaurant and Aspen Lounge, artisan-style Lakeside Bistro, or casual Robert's Pub. 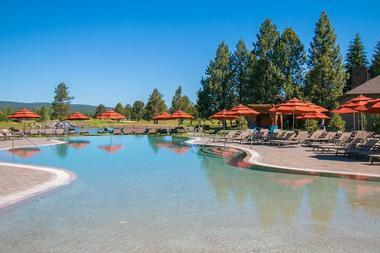 Full luxury treatment packages are offered at the Spa at Black Butte Ranch, including couples' spa treatments. 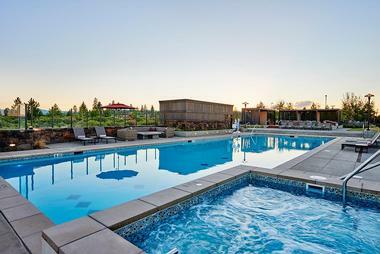 The Allison Inn & Spa is a luxury resort offering an unmatched experience amid Willamette Valley’s lush natural beauty. Ideally situated on 35 hillside acres, seven acres of scenic estate vineyards welcome the guests as they enter this Newberg, Oregon, property. Wine lovers will appreciate the resort’s close proximity to a variety of wineries that include Domaine Serene, Sokol Blosser Winery, Archery Summit, and The Four Graces Winery. Resort guests will be just minutes from Newberg’s restaurants, boutiques, cafes, and retail stores. Guests will enjoy thoughtfully appointed and luxurious rooms and suites during the course of their stay. Accommodations are equipped with 42-inch flat-screen TVs, state-of-the-art Bose sound systems, and complimentary high-speed Internet. 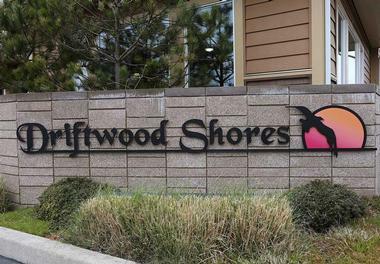 Driftwood Shores Resort & Conference Center is a laid-back, oceanfront hotel located in Florence, Oregon. The resort’s guests will appreciate being just minutes from Florence’s Historic Old Town, boutique shops, chic art galleries, and waterfront restaurants. Guests will have several nearby and popular attractions to explore that include the Sea Lion Caves, Sand Master Park, and the Oregon Dunes National Recreation Area. Outdoor enthusiasts will have plenty of fishing, biking, hiking, and horseback riding available to keep them entertained. Accommodations range from Standard Queen to Double Queen with a kitchen to Deluxe King to a Three Bedroom Condo. All rooms have private bathrooms and either a deck, patio, or balcony offering breathtaking views over the Pacific Ocean. 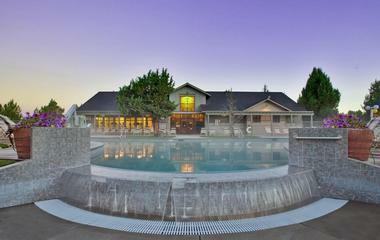 Eagle Crest Resort is a full-service resort situated on the outskirts of the desert-mountain city of Redmond, Oregon. The resort’s impressive 1,700-acre property is nestled up against the picturesque Cascade Mountains, not far from the city of Bend. With more than 300 days of clear skies and sunshine in Redmond each year, guests will enjoy unrivaled access to outdoor activities that include mountain biking, hiking, golfing and rock climbing. There are also several area attractions to explore including Smith Rock State Park, Todd Lake, and Cline Falls State Park. The rooms are bright and airy, tastefully decorated, and feature contemporary furnishings. Resort amenities include a rejuvenating spa, two championship golf courses, a sparkling pool, and on-site dining. Embarcadero Resort Hotel & Marina offers 60 well-appointed guestrooms overlooking a private marina and shimmering Yaquina Bay in Newport, Oregon. The resort’s guests will be conveniently situated within walking distance of Newport’s waterfront dining, cozy cafes, art galleries, and gift shops. They’ll be able to charter whale-watching and fishing excursions with ease, as well as explore nearby attractions that include the Hatfield Science Center, Oregon Coast Aquarium, and Yaquina Head Interpretive Center. The resort offers a variety of accommodations ranging from Queen Studios to One Bedroom King Suites to Premium Rooms, and more. They’re equipped with flat-screen TVs, coffeemakers, private bathrooms and decks, and complimentary Internet. Resort amenities include whirlpools, an exercise room, and a saltwater pool. Travelers looking for a one-of-a-kind, nature filled experience should look no further than the Harriman Springs Resort & Marina in Klamath Falls, Oregon. The resort provides the ideal home base for exploring local attractions including Mt. McLoughlin, Crater Lake National Park, and Winema National Forest. With convenient access to Upper Klamath Lake from the marina, guests can enjoy fun lake activities that include boating, fishing, kayaking, and birding. Adrenaline junkies will want to check out Crater Lake Zipline, or there’s championship golf for the less adventurous. 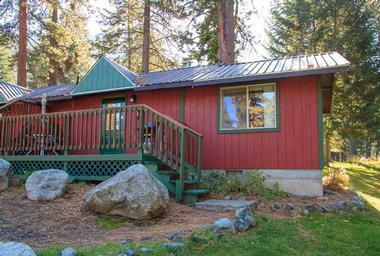 Cabins are spacious and inviting, offer rustic design elements, and are furnished comfortably. Cabin amenities include private bathrooms, flat-screen TVs, microwaves, and private patios. The Kah-Nee-Ta Resort and Spa offers TeePee camping, an RV park, village hotel, and lodge all within the high-desert city of Warm Springs, Oregon. Guests will appreciate the resort’s central location for area attractions that include Mt. Hood National Forest, Ochoco National Forest, and Willamette National Forest. With so much natural beauty surrounding the resort, guests will be imbued with the desire to enjoy some hiking, mountain biking, or horseback riding. Visitors won’t have to travel far for entertainment, as the resort provides mini-golf, a basketball court, volleyball court, and hot-springs pool. 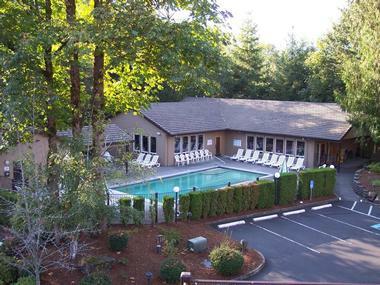 Lodge amenities include a hot tub, swimming pool, fitness room, and tennis courts. Rooms are elegantly decorated, spacious, and equipped with modern amenities. Metolius River Resort is a wonderful, nature-filled getaway situated along the winding Metolius River in Camp Sherman, Oregon. Future guests should imagine casting a fly-fishing line into the sparkling river, or enjoying a good book while being cozied up to a fire in one of the resort’s 11 luxury cabins. 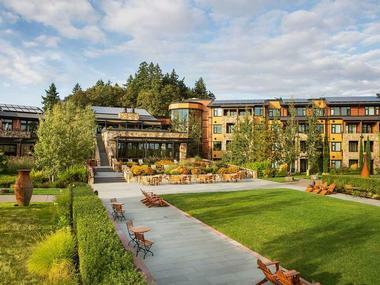 These are the kinds of unforgettable moments guests can expect when lodging at this charming, Pacific Northwest retreat. When snow covers the ground the area is perfect for cross-country skiing and snowshoeing. 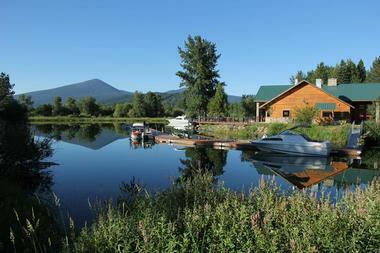 During warmer months, the resort provides an ideal setting for biking, hiking, fly-fishing, and bird watching. Cabins are spacious and bright, feature rustic décor, and are tastefully furnished. They’re equipped with private bathrooms and decks, coffeemakers, and complimentary Wi-Fi. Oregon Garden Resort overlooks the marvelous, 80-acre Oregon Garden in the city of Silverton, Oregon. With its lovely, rustic décor, exceptional comfort, and plethora of modern conveniences, the resort offers wonderfully unique accommodations in Oregon’s beautiful Willamette Valley. The resort is ideally situated for reaching popular area attractions that include Tillamook State Forest, Siuslaw National Forest, and Mt. Hood National Forest. During their stay the resort’s guests will appreciate the sweeping views over the garden, and Willamette Valley’s rolling hills. Rooms have forest-green carpet, beige walls, plush bedding, and contemporary furniture. Room amenities include cable TV, coffeemakers, and private decks or patios. Resort features include a full-service spa, outdoor pool, and complimentary breakfast. Located on Mount Hood in Welches, Oregon, the Whispering Woods Resort offers mountain-side one- and two-bedroom suites ranging from 540 to 1,225 square feet. Each accommodation includes separate sleeping areas, separate dining/living areas, and a fully equipped kitchen, as well as a washer and dryer. They feature fully-furnished patio or deck areas with a gas grill, and wood stove or fireplace. Amenities at the resort include an adjacent golf course, a heated outdoor pool, spa, sauna, outdoor playground, a clubhouse with movies, and complimentary Wi-Fi. The resort’s location also provide guests with easy access to six ski areas, over 1,200 hiking trails, and an array of natural areas including the Mount Hood National Forest. 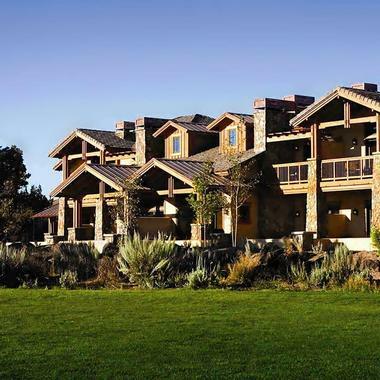 Situated on 640 acres of pristine property with the Cascade Mountains for a backdrop, Pronghorn Resort delivers a luxury experience while representing the very essence of Bend, Oregon’s natural beauty. The resort’s guests will appreciate its close proximity to spectacular trails that are perfect for hiking, mountain biking, and horseback riding. It’s about a 10-minute drive to downtown Bend where guests can explore the city’s restaurants, art galleries, and shops. Visitors will want to free up an evening for the famous Bend Ale Trail, a colorful tour of the city’s award-winning craft breweries. The resort’s accommodations are spacious, well-appointed, and elegantly decorated. Resort amenities include a championship golf course, sparkling swimming pool, and a rejuvenating spa. Travelers can immerse themselves in Central Oregon’s unrivaled beauty when staying at Riverhouse on the Deschutes. 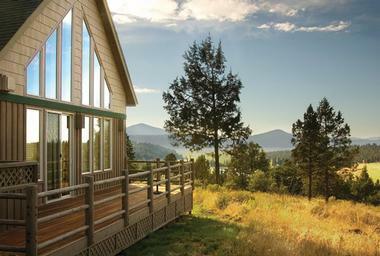 The resort is only a two-minute drive from downtown Bend, Oregon, where guests can grab brunch at McKay Cottage Restaurant, shop at Lulu’s Boutique, and grab a drink at The Dogwood Cocktail Cabin. A plethora of outdoor adventure awaits including hiking the area’s picturesque trails, whitewater rafting on the Deschutes River, and riding ATVs through Oregon’s backcountry. Rooms are spacious, decorated with earth-tone colors, and provide chic, contemporary furnishings. 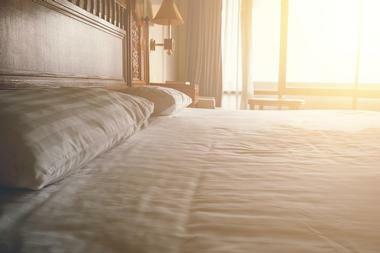 Room amenities include private bathrooms, Keurig coffeemakers, complimentary Wi-Fi, and flat-screen TVs with free HBO. The resort is equipped with outdoor and indoor pools, hot tubs, and a state-of-the-art fitness center. For a truly unforgettable and one-of-a-kind Oregon experience, visitors will want to give serious consideration to the Running Y Ranch Resort in Klamath Falls. The ranch features several upscale accommodations, including custom homes and chalets, a full-service spa, and the only golf course in the state designed by world-renowned golf course architect and PGA professional, Arnold Palmer. There are several outdoor activities in the area for guests to enjoy that include birding, fly fishing, kayaking, and golfing. The area offers a variety of attractions to explore including Crater Lake, Lava Beds National Monument, and Collier State Park. The rooms are airy and bright, furnished comfortably, and tastefully decorated. They’re equipped with wireless Internet, coffeemakers, private bathrooms, and 42-inch flat-screen TVs. For a coastal Oregon retreat unlike any other, travelers may want to stay at the Salishan Resort in Gleneden Beach, Oregon. The resort’s 150 acres of serene property are sprawled along the picturesque Oregon coast, and offer its guests unparalleled views over the mighty Pacific Ocean. The resort is equipped with an 18-hole championship golf course that winds its way through an old-growth forest before stretching along the scenic shoreline. Guests can enjoy a relaxing massage treatment at the spa, take a romantic stroll along the beach, or watch the eagles soar above Siletz Bay from the outdoor infinity whirlpool. The luxuriously-appointed rooms are spacious, equipped with modern amenities, and feature rustic design elements. Hallmark Resort Hotel & Spa Cannon Beach is a classic, oceanfront resort situated just steps from the iconic Haystack Rock in Cannon Beach, Oregon. Guests staying at the resort will appreciate being within walking distance of shops, waterfront cafés and restaurants, and art galleries in downtown Canon Beach. There are several, incredibly beautiful state parks nearby for guests to explore that include Hug Point State Park, Ecola State Park, and Oswald West State Park. The resort offers well-appointed oceanfront, ocean-view, and non-view (for the value-conscious) rooms and suites for guests to enjoy. 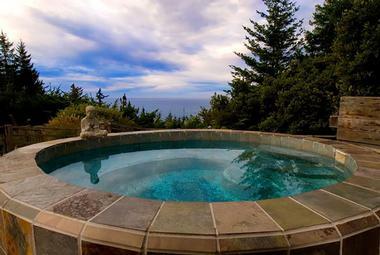 Many of the rooms provide marvelous views of the Pacific Ocean, Haystack Rock, and Tillamook Lighthouse. Room amenities include Keurig coffeemakers, complimentary high-speed internet, and flat-screen TVs. 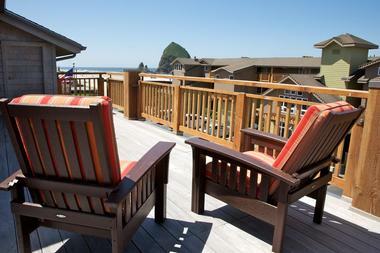 Surfsand Resort is a polished, yet laid-back, resort sprawled along the Pacific coastline in Canon Beach, Oregon. Resort guests will not only have incredible views of Haystack Rock during their stay, they’ll be just a few minutes’ walk down the beach from the iconic attraction. Guests can relax in a hammock amid the primeval grass, embrace the nostalgia of beach bonfires and s’mores, and let the hypnotic sounds of the mighty Pacific Ocean sooth their souls. Rooms are elegantly decorated, offer modern furnishings, and provide lots of natural light. 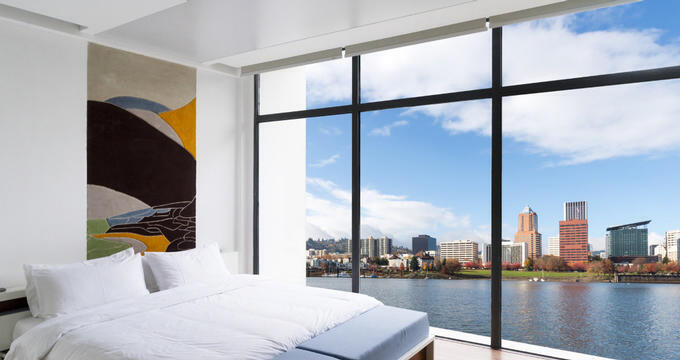 Most rooms are equipped with opulent amenities that include soaking tubs, gas fireplaces, flat-screen TVs in the rooms and bathrooms, patios or balconies, and picturesque ocean views. 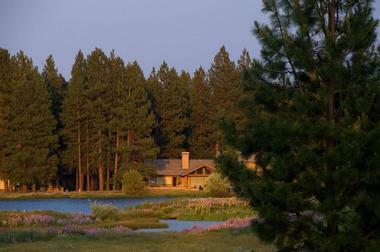 Tetherow is an upscale resort, and the only one backed up to the Deschutes National Forest in Bend, Oregon. With the forest just steps away, guests will enjoy unrivaled access to thousands of acres, perfect for fishing, sightseeing, kayaking, and hiking. Guests will have a variety of resort amenities to enjoy including an 18-hole championship golf course, on-site dining, sparkling pool, hot tub, fire pits, cabanas, and a state-of-the-art fitness center. There are several nearby attractions for guests to explore that include the Tumalo Falls, Sparks Lake, and Lava River Cave. Rooms are spacious, tastefully decorated, and equipped with contemporary furnishings. Most of the rooms have amenities that include gas fireplaces, private bathrooms, complimentary Wi-Fi, and flat-screen TVs. Cooper Spur Mountain Resort is a rustic mountain lodge with log cabins and a farm-to-table restaurant located in Mt. Hood, Oregon. Nature lovers will appreciate the resort’s location within Mt. Hood National Forest where they’ll be close to roaring waterfalls, beautiful meadows, and tranquil, glacial creeks. Just minutes from the resort, guests can experience some of the most scenic hiking trails in the Pacific Northwest including the Trillium Lake Loop Trail, Timberline Trail, and the famous Pacific Crest Trail. During the winter guests will be happy with the resort’s close proximity to the mountain’s lodge and chairlifts. 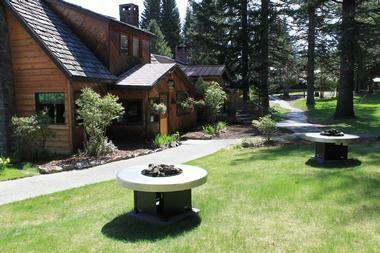 Accommodations provide a warm and inviting ambiance, rustic décor, and lodgepole furnishings. They’re equipped with private bathrooms, satellite TV, and coffeemakers. Mt. Hood Oregon Resort is tucked among the evergreen forests and majestic mountains of Oregon’s high country in the city of Welches. Guests will have everything at their disposal for an unforgettable experience including a rejuvenating spa, 27 holes of championship golf, and sensational cuisine at the resort’s on-site restaurants. Guests will have easy access to the nearby Mt. Hood National Forest where they can enjoy outdoor recreational activities that include hiking, rafting, fishing, climbing, and horseback riding. Rooms feature patterned gray carpet, beige walls with dark gray accent walls, a sleek, modern design, and contemporary furnishings. Room amenities include plush bedding, private bathrooms, wall-mounted HDTVs, and complimentary high-speed Internet. Wallowa Lake Resort provides luxury vacation rentals, rustic cabins, homes, duplexes, and condominiums at Wallowa Lake in Joseph, Oregon. The resort is equipped with a variety of accommodations that range from studio cabins all the way up to six-bedroom lodges, offering rental options that meet the needs of every budget. There’s a plethora of outdoor adventure awaiting resort guests that includes hiking to high lakes and waterfalls, boating, fishing, horseback riding, skiing, snowboarding, and tubing. Travelers won’t want to miss out on the bumper boats, mini golf, or hot-air balloon rides. Lodging amenities include complimentary wireless Internet, private bathrooms, and cable TV. Guests will find this resort is the perfect home-base for exploring Oregon’s unique rivers, lakes, mountains, and wildlife. Travelers will find the WildSpring Guest Habitat situated just off of the scenic Oregon Coast Highway in the seaside community of Port Orford. The resort’s guests will appreciate being just minutes from downtown Port Orford’s restaurants, cafés, and retail stores. There are a variety of local attractions in the area for guests to explore that include the Cape Blanco Lighthouse, Cape Blanco State Park, Battle Rock State Park, Port Orford Lifeboat Station Museum, and Humbug Mountain State Park. Five cabins are nestled amongst the forest’s towering pines, surrounded by Oregon’s marvelous wildlife and beauty. They’re equipped with overstuffed loveseats, vintage and antique furniture, and various artwork. Each cabin has a 28-inch flat-screen TV, private bathroom, refrigerator, and massage table. 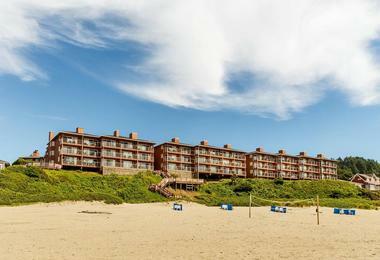 WorldMark Seaside is an impressive, beachfront, all-suite resort located in the city of Seaside, Oregon. The resort offers accommodations that range from studios up to three-bedroom suites, that comfortably sleep between one and eight guests. Resort guests can charter deep-sea fishing tours, hike the Tillamook Head Trail, and squeeze in rounds of golf at Highlands Golf Club. Visitors will appreciate the ease with which they can reach area attractions that include Camp 18 Museum, Seaside Aquarium, and Seaside Beach Lewis and Clark Monument. Suite amenities include private bathrooms, gas fireplaces, air-conditioning, and high-speed Internet. The resort is equipped with a children’s playground, pools, hot tubs, and a fitness center. 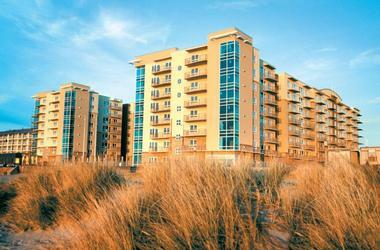 Best Western Plus Ocean View Resort is an oceanfront hotel situated along Seaside, Oregon’s famous promenade. The resort’s guests will appreciate being within walking distance of Seaside’s charming boutiques, impressive art galleries, cozy cafes, and sensational restaurants. Guests staying here will have the opportunity to enjoy activities ranging from a hike along the Tillamook Head Traverse to exploring the Seaside Aquarium to spending the day at the Arcadia Beach State Recreation Area. Many of the resort’s rooms offer breathtaking views of the grassy sand dunes and North Pacific Ocean. 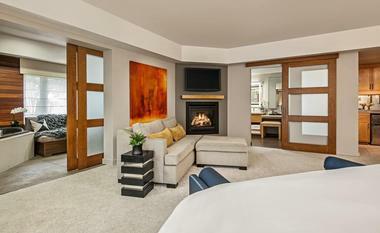 The resort provides opulent room amenities that range from oversized jetted tubs to fireplaces to patios or balconies. The hotel is equipped with an indoor pool, complimentary Wi-Fi, and fitness room. Brasada Ranch is a resort offering luxury amenities, world-class dining, and a championship golf course in Powell Butte, Oregon. For the last three years the resort has been recognized as the “Best Resort in the Pacific Northwest,” by a top travel magazine. The resort is ideally situated for reaching local attractions that include Smith Rock State Park, Redmond Caves Recreation Area, and the picturesque Todd Lake. Outdoor enthusiasts will appreciate being just minutes from the Brasada Trails where they can enjoy hiking, mountain biking, and horseback riding. 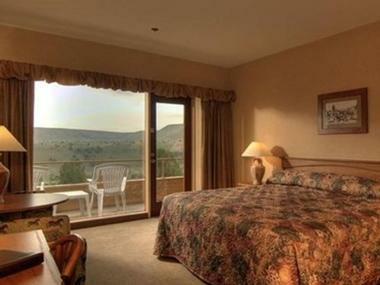 The resort delivers accommodations that feature ranch-style authenticity with modern comfort. Some of the rooms feature opulent touches that range from private hot tubs to large soaking tubs to private patios with grills.